Sarah Nader - snader@shawmedia.com A tub of Sommer Field's garlic dill pickles wait for customers during the Crystal Lake farmers market at Depot Park Saturday, August 24, 2013. 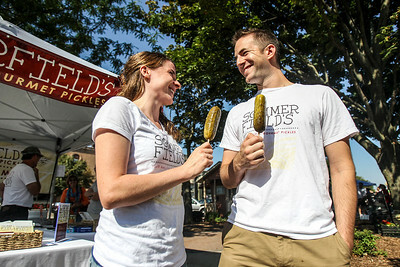 Sarah Nader - snader@shawmedia.com Madison Sommerfield (left) and her husband, Matt Sommerfield of Crystal Lake pose for a portrait at their pickle stand at the Crystal Lake farmers market Saturday, August 24, 20013. 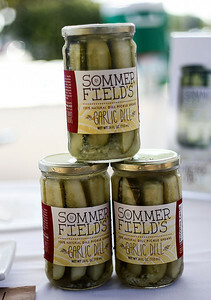 Sarah Nader - snader@shawmedia.com A collection of Summer Field's garlic dill pickles are displayed during the Crystal Lake farmers market at Depot Park Saturday, August 24, 2013. 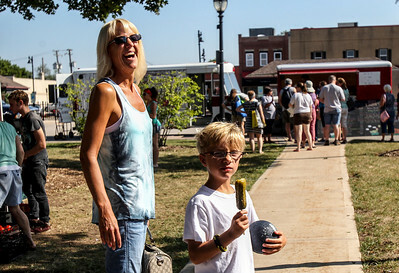 Sarah Nader - snader@shawmedia.com Stacy Ormsby (left) of Crystal Lake and her son, Ethan, 7, walk around the farmers market after buying a pickle of a stick at Summer Field's pickle stand during the Crystal Lake farmers market at Depot Park Saturday, August 24, 2013. 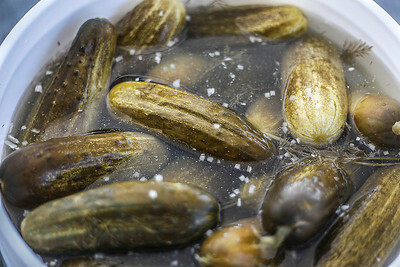 A tub of Sommer Field's garlic dill pickles wait for customers during the Crystal Lake farmers market at Depot Park Saturday, August 24, 2013.